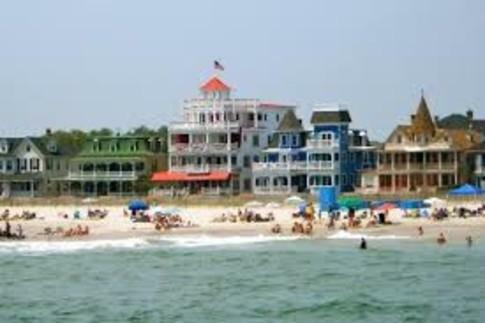 For many, Cape May epitomizes the perfect quaint New England seaside resort town due to its picturesque perch on the southern tip of New Jersey. Seafood fans might know that it’s the second largest fishing port on the Eastern seaboard, famous for its Cape May Salts. These Atlantic oysters have a salty, succulent flavor that has been enjoyed since at least the 1600s when Native Americans were discovered savoring them in the area. Architecture enthusiasts might know about the city’s more than 600 hundred Victorian-era buildings with gingerbread flourishes, affectionately known as “painted ladies.” During the summer months, many of these homes are rented out for beachgoers, earning the area an unofficial title of Bed & Breakfast Capital of the World. Vacationers have been flocking to Cape May for over 200 years, but an important reason behind the growth of this resort community is rarely mentioned or acknowledged: the availability of local food. Even in the 1900s, when visitors would board stage coaches from nearby cities like Philadelphia, Baltimore and Washington DC to Cape May to escape the stifling city heat, they enjoyed dining on farm-fresh food they couldn’t get back home. In 1985, West Cape May even started an annual Lima Bean Festival to celebrate this lowly legume. The festival had everything from a crowning of a Miss Lima Bean to a bean-eating contest to selling every lima product you could imagine: lima bean soup, quiche, pizza, pate and mousse, followed by Key Lima pie for dessert. In the early 1990s, Hanover Foods pulled the contract and by 1992, only four lima bean farms remained. The area continued the festival as a quirky tradition, but had to supplement their stock with beans from neighboring states. The Rea family was one of the last to hold on. At the height of the lima bean, they devoted 1,000 acres to planting that crop alone; but in the early 2000s, only grew 40 acres of more popular vegetables to fuel their farm stand. Getting the 62-acre property back in order took some time, especially since it was surrounded by protected wetlands. In order to restore the farm road, they needed to use old aerial photographs from the 1930s and 1950s to prove its existence through the protected marsh. BERKSHIRE PIGS AT THE FARM. PHOTO COURTESY OF CAPE RESORTS. Eight seasons later Beach Plum Farm thrives as a sustainable farm, and has reinvigorated the community’s interest in supporting local foods. More than 100 varieties of fruits, vegetables and herbs are grown on the 62-acre farm, hand-picked and delivered to three local restaurants less than two miles away — The Ebbitt Room, The Blue Pig Tavern and The Rusty Nail — so chefs feature them in weekly specials. The farm is home to over 800 chickens and has established a Community Supported Agriculture (CSA) egg program for the community to enjoy eggs at home as well as in the restaurants. The pig program at the farm has also been recently expanded to an 11-acre property to supply antibiotic-free, healthy Berkshire pork. There are 24 beehives on the property to harvest local honey. BRINGING FRESH VEGETABLES FROM THE FARM TO THE RESTAURANTS. PHOTO COURTESY OF CAPE RESORTS. It has been a fun challenge for the chefs to plan their meals around the available crops. New Jersey is famous for its tomatoes, so the farmers made sure they planted plenty. This led to an almost overwhelming harvest in 2014 — over 10,000 pounds of tomatoes including Champion, New Girl, Green Zebra, Brandywine, Big Beef and Sun Gold. On a whim, Executive Chef Jeremy Einhorn offered a “Build-Your-Own-Tomato-Sandwich” at Blue Pig Tavern. Fortunately, customers loved it, especially because the BLTs included Berkshire bacon and Caprese sandwiches featured basil from the farm. The leftover tomatoes were stewed to become the sauce for the new brick oven pizzas at The Boiler Room. The farm plans to expand the production even further so pizza sauce has farm tomatoes all year round. NEW BARN AND FARM STAND. PHOTO COURTESY OF CAPE RESORTS. In addition to getting people excited about eating local through serving delicious dishes at the restaurants, Beach Plum Farm is spreading awareness through tours and events. Anyone in Cape May can walk or bike to the farm (41 Stephens Street) for guided or self-guided tours. They hired an Amish company from Lancaster, Pennsylvania to built an old-fashioned barn made out of Hemlock wood, carved to fit perfectly with mortise and tenon joinery. During the weekend, the farm stand sells produce, eggs and honey. They plan on opening a café in the barn so you can start your morning with a farm-fresh breakfast. During the Fall and Spring farm festivals, children meet here to take part in the hands-on “Farm-to-Kids” program to learn about farming. Returning to a reliance on locally grown produce is nothing new, but Beach Plum Farm has caused modern visitors to celebrate this aspect of Cape May’s history. This year is the 200th anniversary of America’s oldest seaside resort, Congress Hall Hotel, one of the main users of the produce from Beach Plum Resorts farm. As part of the bicentennial celebration this summer, chefs will plan special dinners inspired by 19th century menus, which featured local produce because that was the only option. Thanks to Beach Plum Farm, Congress Hall is coming full circle and embracing one of its oldest traditions. Don’t leave town without indulging in one of the most subtle, but most tasty Cape May attractions.